Orca Bay Wave Deck Shoe is an hybrid of a sport and deck shoe. Combining supple deck shoe leather with running shoe technology, its many features make it a stylish and versatile shoe for those leading an active life. Avalable in three great colours, this is a breathable, hard-working, high-performance men&apos;s shoe. 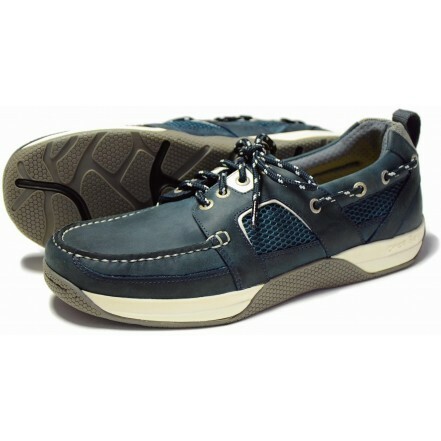 • Combines best elements of a Sports Shoe and Boat Shoe. • High quality leather shoe using running shoe technology for great performance. • Strong synthetic cord laces. • Canvas pull tab at heel for ease of use. • Polyester lining which wicks away moisture keeping your feet dry and comfortable. • Cushioned foot bed for added comfort. • Patterned sole giving superb grip for great traction.